A 20-pound African desert tortoise with an uncertain future found a home last weekend, according to his current and future owners. Bolt, the 4-year-old African sulcata tortoise, had been living at the Big Wood School in Ketchum with kindergarten teacher Julie Swenke after having been given up by his previous owner earlier this month. Though Swenke said she would love to keep the tortoise, she added that she didn't have the resources to care for what would eventually become a 200-pound tortoise. Swenke said at the time that she was searching for possible homes for it, either a private home or a zoo. "We cannot keep him," Swenke said last week. "A lot of zoos won't even take him because if they have another giant tortoise, they can't put them together." Last Saturday, Ketchum resident Karsten Fostvedt, a veterinarian at the St. Francis Pet Clinic in Ketchum, offered to take the animal in. "I told [Swenke], 'I know tortoises, no problem,'" he said. Fostvedt said he grew up in Palm Springs, Calif., in the 1950s and 1960s—before there was air conditioning and irrigation. "At that time, Palm Springs was actually desert!" Fostvedt said with a laugh. "We had everything from lizards to desert tortoises, you name it, as pets." Of course, Fostvedt's home needs tortoise-proofing. He said that he has bought two enclosures, one for the clinic and one for his garage, and Bolt will split his time between the two. Swenke's brother, who owns a landscape company, will be in charge of ensuring that Fostvedt's fences stand up to tortoise-containing standards. 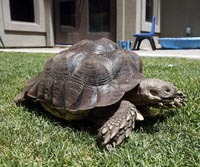 Fostvedt said that his tortoise in Palm Springs used to escape from time to time, but he was always returned due to the phone number written on his shell. As for Bolt's name, Fostvedt said he'd keep it—partly because of its connection to Usain Bolt, the 25-year-old Jamaican sprinter and one of the fastest men in the world. "Bolt, of course! It's the perfect name," Fostvedt said. "He's going to be our clinic mascot, and it's going to be a lot of fun."